Home » Business » Which Chase Ink Business Credit Card Is Right for You? Which Chase Ink Business Credit Card Is Right for You? It’s time to choose a new credit card for your business, but with so many options out there, how do you decide? Chase offers three self-branded, business credit cards — Ink Business Cash℠ Credit Card, Ink Business Preferred℠ Credit Card and Ink Business Unlimited℠ Credit Card — that could be a good fit. Free employee cards that let you set and change individual spending limits. Redeem cash back via a statement credit, a direct deposit to most U.S. checking and savings accounts; travel booked at the Chase Ultimate® Rewards website, on Amazon.com or for gift cards. Perks including travel and emergency assistance services, auto rental collision damage waiver, roadside dispatch, purchase protection and an extended warranty. 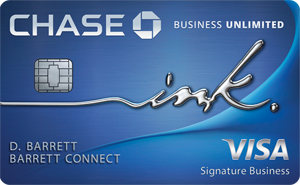 If you already have the Ink Business Preferred℠ Credit Card, the Chase Sapphire Preferred® Card or the Chase Sapphire Reserve®, you can combine the rewards you earn on them with the cash back earned on the Ink Business Cash℠ Credit Card or the Ink Business Unlimited℠ Credit Card. After converting the cash back earned on those two cards into points, you can use the combined rewards to receive between 25% ( Ink Business Preferred℠ Credit Card and Chase Sapphire Preferred® Card) and 50% (Chase Sapphire Reserve®) more value for them when you redeem them for travel on the Chase Ultimate Rewards website. All three cards have a broad definition of travel, including airlines, hotels, motels, timeshares, car rental agencies, cruise lines, travel agencies, discount travel sites, campgrounds and operators of passenger trains, buses, taxis, limousines, ferries, toll bridges and highways, and parking lots and garages. But in-flight goods and services, onboard cruise line goods and services, sightseeing activities, excursions, tourist attractions, merchants within hotels and airports aren’t included. None of the cards come with tools to help you manage business expenses, however, like many of their competitors. Which card you choose depends on several factors, including the annual fee, the value of the sign-up bonus, categories that pay the highest cash back and ones with the most flexibility when it’s time to redeem rewards. We’ll look at the differences between the Ink Business Cash℠ Credit Card and Ink Business Unlimited℠ Credit Card, along with features of the Ink Business Preferred℠ Credit Card. We’ll also explore what makes each of these cards worth your consideration, along with why you might pause before hitting the apply button. Best for: A business just getting off the ground or a small company that needs a card with no annual fee, but wants decent rewards and a few perks. Why we like it. The card has a $0 annual fee. New cardmembers earn $500 bonus cash back after you spend $3,000 on purchases in the first 3 months from account opening. Cardholders Earn 5% cash back on the first $25,000 spent in combined purchases at office supply stores and on internet, cable and phone services each account anniversary year. Earn 2% cash back on the first $25,000 spent in combined purchases at gas stations and restaurants each account anniversary year. Earn 1% cash back on all other card purchases with no limit to the amount you can earn. This card is really attractive because the cash back it offers is higher in categories that businesses value. Cash flow can be tight for new or smaller businesses, so intro APRs can be quite helpful. The card’s intro purchase APR is 0% for 12 Months (after, 15.49% - 21.49% Variable APR). For a card with no annual fee, the travel and protection perks aren’t half bad. It includes travel and emergency assistance services, roadside dispatch, auto rental collision damage waiver, purchase protection and extended warranty. Things to watch out for. The sign-up bonus requires what could be seen as a high spend for a small reward. Watch out for the yearly spending caps on the top cashback categories because once you hit them, you’ll only earn the lowest amount until your next cardmember anniversary. If you do a balance transfer, know that it will cost Either $5 or 5% of the amount of each transfer, whichever is greater. Read our full review of the Ink Business Cash℠ Credit Card. Best for: This $0 annual fee card also targets start-up or smaller businesses that are fine earning simple flat cashback rewards. Why we like it: Like the Ink Business Cash℠ Credit Card, this card also has a $0 annual fee and allows new cardmembers to Earn $500 bonus cash back after you spend $3,000 on purchases in the first 3 months from account opening. The big difference between the two cards is in the way cash back is earned. 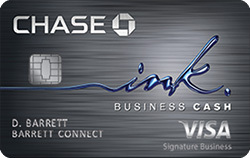 Ink Business Unlimited℠ Credit Card cardholders Earn unlimited 1.5% cash back on every purchase made for your business. It means businesses don’t have to track different spending categories. This card also comes with the same intro purchase and balance transfer offers as the Ink Business Cash℠ Credit Card. The purchase intro APR is 0% for 12 Months (After, 15.49% - 21.49% Variable APR). Things to watch out for: Again, some may not be willing to spend the money needed to get the card’s sign-up bonus. You earn the same lower flat rate on all spending. A balance transfer will cost Either $5 or 5% of the amount of each transfer, whichever is greater. Read our full review of the Ink Business Unlimited℠ Credit Card. Best for: More established businesses that don’t mind paying an annual fee in exchange for a sweet sign-up bonus, higher points in top spending categories and more generous perks. Why we like it: New cardmembers are enticed with a sign-up bonus that lets them Earn 80,000 bonus points after you spend $5,000 on purchases in the first 3 months from account opening. That adds up to $1,000 that can be spent on travel at the Chase Ultimate Rewards website. Earn 3 points per $1 on the first $150,000 spent in combined purchases on travel, shipping purchases, Internet, cable and phone services, advertising purchases made with social media sites and search engines each account anniversary year. Earn 1 point per $1 on all other purchases—with no limit to the amount you can earn. And they’re in spending categories that are attractive to businesses. Points earned are worth 25% more when you redeem for travel at the Chase Ultimate Rewards website. You can use your points on vacation packages, cruises or flights on most major airlines with no restrictions or blackout dates. Buy gift cards, pay for part or all of your orders at Amazon.com or redeem points for cash back as a statement credit or direct deposit to most U.S. checking and savings accounts. The card has a regular purchase rate of 18.24% - 23.24% Variable APR. The balance transfer rate is 18.24% - 23.24% Variable APR. You can transfer the points you earn on the card 1:1 to nine airline or three hotel loyalty programs in 1,000-point increments. Use free employee cards to track spending and set spending limits. Other perks include cellphone protection, trip cancellation/trip interruption insurance, roadside dispatch, auto rental collision damage waiver, purchase protection and an extended warranty. Feel free to take this card out of the country since it has a $0 foreign transaction fee. Things to watch out for: You can’t earn higher points on dining and gas on the card, two spending categories that may be important to your businesses. There’s a $150,000 per account anniversary cap for spending in the top points categories. After that, it drops to an unlimited 1 point per dollar spent. There’s no intro purchase or balance transfer APR with this card. The balance transfer rate is Either $5 or 5% of the amount of each transfer, whichever is greater. You may be charged a fee to transfer your points to an airline or hotel loyalty program. Give yourself time to make a points transfer. Most are done within a business day, but it may take up to seven business days for the transfer, depending on the loyalty program. Read our full review of the Ink Business Preferred℠ Credit Card. Rewards Earn 5% cash back on the first $25,000 spent in combined purchases at office supply stores and on internet, cable and phone services each account anniversary year. Earn 2% cash back on the first $25,000 spent in combined purchases at gas stations and restaurants each account anniversary year. Earn 1% cash back on all other card purchases with no limit to the amount you can earn. Earn unlimited 1.5% cash back on every purchase made for your business Earn 3 points per $1 on the first $150,000 spent in combined purchases on travel, shipping purchases, Internet, cable and phone services, advertising purchases made with social media sites and search engines each account anniversary year. Earn 1 point per $1 on all other purchases—with no limit to the amount you can earn. Chase has given businesses some solid options with its three Ink credit card offerings. The Ink Business Cash℠ Credit Card and the Ink Business Unlimited℠ Credit Card allow businesses to choose between flat rewards or higher cash back in key spending categories — with no annual fee. Both cards also come with some perks that keep businesses running. 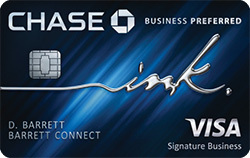 The Ink Business Preferred℠ Credit Card, with its $95 annual fee, allows you to earn higher points in popular spending categories, along with the chance to get more value when you spend them at the Chase Ultimate Rewards website. Is the sign-up bonus tempting enough to spend what’s required to get it? Do you want a card that offers flat cash back? Do you want to earn higher points or more cash back in key spending categories? Is the annual fee worth the perks and benefits that come with it? Will your business use the perks that come with the card? Once you answer these questions, you can decide which card is the best for helping you operate and grow your business. Read The Best Small Business Credit Cards for February 2019.
Business credit reports: What are they, how do you get one? Is Interest on a Business Credit Card Tax Deductible?